Sociology empowers students to see the world around them through a sociological lens, helping them better understand their own lives and the world we all share. John Macionis, author of the best-selling Introductory Sociology franchise over the last three decades, takes students step by step through the theories and research that make up the discipline, helping them to find and use the science of social behavior in everyday life. In addition to extensively updated data, the Sixteenth Edition offers engaging discussions of hot-button contemporary topics such as the increased proliferation of social media as well as expanded coverage of race, class, and gender. MySocLab for the Introductory Sociology course extends learning online to engage students and improve results. Media resources with assignments bring concepts to life, and offer students opportunities to practice applying what they’ve learned. Please note: this version of MySocLab does not include an eText. 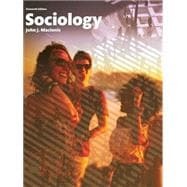 Sociology, Sixteenth Edition is also available via REVEL™, an interactive learning environment that enables students to read, practice, and study in one continuous experience. John J. Macionis was born and raised in Philadelphia, Pennsylvania. He earned a bachelor’s degree from Cornell University and a doctorate in sociology from the University of Pennsylvania. John Macionis' publications are wide-ranging, focusing on community life in the United States, interpersonal intimacy in families, effective teaching, humor, new information technology, and the importance of global education. In addition, John Macionis and Nijole V. Benokraitis have edited the best-selling anthology Seeing Ourselves: Classic, Contemporary, and Cross-Cultural Readings in Sociology. Macionis and Vincent Parrillo have written the leading urban studies text, Cities and Urban Life (Pearson). Macionis’ most recent textbook is Social Problems (Pearson). John Macionis is Professor and Distinguished Scholar of Sociology at Kenyon College in Gambier, Ohio, where he has taught for almost thirty years. During that time, he has chaired the Sociology Department, directed the college’s multidisciplinary program in humane studies, presided over the campus senate and the college’s faculty, and taught sociology to thousands of students. In 2002, the American Sociological Association presented Macionis with the Award for Distinguished Contributions to Teaching, citing his innovative use of global material as well as the introduction of new teaching technology in his textbooks. At Kenyon, Macionis teaches a number of courses, but his favorite class is Introduction to Sociology, which he offers every semester. He enjoys extensive contact with students and invites everyone enrolled in each of his classes to enjoy a home-cooked meal. The Macionis family–John, Amy, and children McLean and Whitney–live on a farm in rural Ohio. In his free time, Macionis enjoys tennis, swimming, hiking, and playing oldies rock-and-roll (he recently released his first CD). Macionis is as an environmental activist in the Lake George region of New York’s Adirondack Mountains, working with a number of organizations, including the Lake George Land Conservancy, where he serves as president of the board of trustees.